Unfortunately for some dog owners, their pets seem to love nothing more than splashing in puddles, running through fields, and rolling in mud – or worse! When you’re faced with a dog that is covered in muck, the best option is usually to give them a bath. So, how do you give your dog a bath? And when is the best time to do it? Read on to learn more about washing your dog, and some useful tips to make the process as easy as possible. Unlike us, dogs do not need to be washed very often. Their skin is much thinner than ours and is more sensitive – meaning that if they are bathed too often it can irritate or dry out their skin and coat, which can then cause skin problems and strip essential protective oils from the coat. Unless your dog is particularly wet, muddy, or has rolled in something unpleasant, a bath every few months will be fine to help them maintain a healthy, shiny coat. Some breeds with certain types of coat may need grooming more often, for example, every six weeks. How often you bath your dog also depends on the type of coat they have, their breed and what they like to do for exercise. For example, dogs with longer hair will need bathing and grooming more often. Similarly, if your dog likes swimming or digging, it is likely they will get dirty more often than dogs who prefer being indoors. The most important tool for bathing your dog is dog shampoo. You must use a special hypoallergenic dog shampoo to prevent irritation and dryness – not a normal human shampoo. The PH in human shampoo is different to that in dog shampoo and is bad for their skin. If you are unsure which shampoo will be best for your pup, consult a vet or dog grooming expert. You will also need a dog brush or comb – this is useful for removing knots, mats, dried dirt or mud prior to getting in the bath. Getting rid of as much dirt as you can beforehand will make the process run more smoothly and reduce the amount of time your dog must spend in the bath. You should try to avoid washing your dog’s face with the shampoo, or wetting their head in the bath at all as you are more likely to get shampoo in their eyes and ears, and can cause distress. If your dog’s face is dirty, try cleaning it with a damp cloth before or after bathing them. Some owners also like to use a hypoallergenic dog conditioner after shampooing for added health and shine. For the bath itself, you could use your own tub – if it has a handheld shower head this is even better. If you have access to a garden, using a plastic tub outside would reduce the amount of mess inside your house. Nevertheless, many dogs do not enjoy bathing when they are cold, so make sure you bath them on a mild day and use warm water! A rubber bath mat is also recommended to help prevent your dog from slipping around inside the tub. Prepare a towel for after the bath. If you have a towel you normally use with your dog, it’s best to use that every time to provide reassurance – plus, using an old towel means it doesn’t matter if it gets dirty! If you find yourself in possession of a dirt-encrusted dog, it can be difficult to know where to start, especially if they are keen to avoid a bath at all costs! A wriggly, muddy dog can cause chaos – especially for your clothes, carpet and furniture. Firstly, make sure you use a safe, familiar space. Bath time can be upsetting for nervous dogs, so make an effort to stay calm and reassure your dog throughout the process. You can use treats or encouragement to reward good bath time behaviour. Bathing can be a stressful experience, so it is best to get your dog confident around the process as early as possible. Next, it’s time to run the bath. You should use lukewarm water, as hot water can scald your dog’s sensitive skin. Too cold, and you may find you have a shivering pup on your hands. Don’t run the bath too deep – and if possible, keep the plughole open to allow water to drain to avoid the dog inhaling or drinking water with shampoo in it. 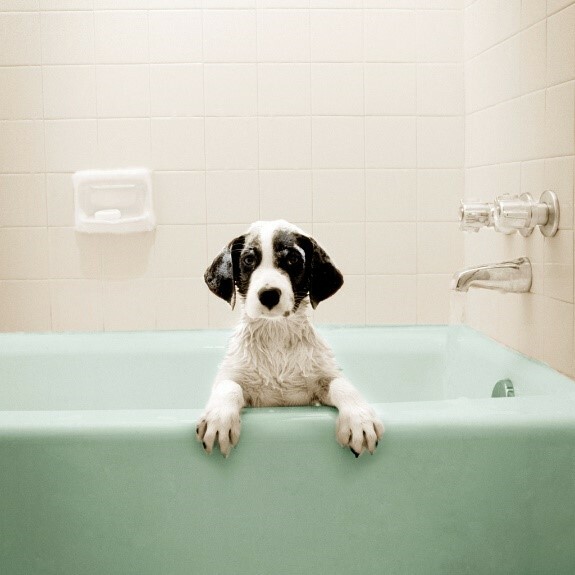 Gently lift or help your dog into the tub, and firmly hold them in place with one hand. You can then use the other hand or a plastic jug to scoop up water and clean your dog’s coat. You can also use this as an opportunity to check your dog’s coat for any suspect lumps, bumps or fleas. Next, simply follow the instructions on your dog shampoo to wash your dog. The best way is to work from their paws upwards, feet toback, to avoid shampoo and water getting in sensitive spots such as the eyes or mouth. Wash your dog’s coat using small, circular motions, concentrating on particularly dirty spots. When the water runs clear, you’ll know your dog is clean. Finally, towel your dog off, and give them a treat as a reward to reinforce the idea that bath time is a positive experience. You should now be able to make bath time fun and enjoyable for both you and your dog!